In Vajrayana Buddhism, Akshobhya (Sanskrit for «Immovable One», Jp. 阿閃如来 Ashuku nyorai) is one of the Five Wisdom Buddhas, a product of Adibuddha who represents consciousness as an aspect of reality. By convention he is located in the east of the Diamond Realm and is the Lord of the Eastern Pure Land Abhirati (‘The Joyous’), although the Pure Land of Akshobhya’s western counterpart Amitabha is popularly far better known. His Shakti is Locana and he is normally accompanied by two elephants. His color is blue and attributes include the bell, three monkish robes, and staff, along with a jewel, lotus, prayer wheel, and sword. He has several emanations. 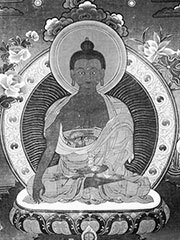 Akshobhya appears in the «Scripture of the Buddha-land of Akshobhya» (阿閃仏国経 Ashuku Bukkyokukyō), dating from 147 CE and the oldest known Pure Land text. According to the scripture, a monk wished to practice the Dharma in the eastern world of delight and made a vow to think no anger or malice towards any being until enlightenment. He duly proved «immovable» and when he succeeded, he became the Buddha Akshobhya. Akshobya is sometimes merged with Acala (Jp. 不動明王 Fudō myō-ō), whose name also means the Immovable One in Sanskrit. However, Acalanatha is not a Buddha, but one of the Five Wisdom Kings of the Womb Realm in Vajrayana. Prior to the advent of Bhaisajyaguru (Yakushi), Akshobya was the subject of a minor popular cult in Japan as healing Buddha. Akshobhya is believed to transform the human failing of anger into a clear mirror-like wisdom. With this wisdom, we see things just as they are, impartially and unaffectedly. Indeed, whether it be a red rose or a bloody dagger, a mirror will reflect both just as they are. Akshobhya’s blue color is closely linked to the mirror symbolism. Blue is the color of water, and water has the capacity to act as a clear mirror. Akshobhya makes the Bhumisparsha mudra (earth touching gesture). This gesture suggests confidence, deep-rootedness, and the same kind of determination which carried the Buddha to his enlightenment, inspite of the numerous hurdles which crossed his path. Akshobhya’s emblem is the vajra, the symbol of Vajrayana Buddhism. The vajra essentially signifies the immovable, immutable, indivisible, and indestructible state of enlightenment. Thus is Akshobhya touching the earth with the fingertips of his right hand, the earth too being a symbol of the immutable, the solid, and the concrete. Akshobhya’s mount is the elephant. An elephant places its foot upon the earth with unshakeable certainty. It has the same unalterable quality as the Buddha’s fingers touching the ground, and the same determination that carried Buddha through his tribulations.